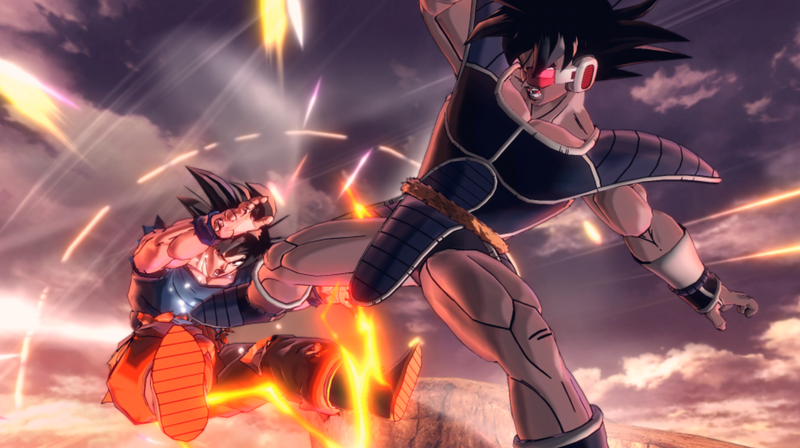 One of the most prolific game series in existence despite being licensed, Dragon Ball has seen its fair share of the good, the bad, and the why did they even bother. Due out early next year, Dragon Ball FighterZ might well end up being one of the series’ best releases to-date. With everyone focused on the upcoming game’s gorgeous art style and endless drip-feed of new character reveals though, it’s easy to forget just how varied and totally worthy of nostalgic affection some of the earlier games were. I mean come on: the very first one came on a cassette after all. Dragon Ball: Dragon Daihikyou was a shoot’em up where Goku hectored enemies with his power pole and kamehameha blasts while grabbing food to keep his power levels up. It was the first Dragon Ball video game to ever be released and the only one not made by Namco Bandai. Later on there was Dragon Ball: Shenron no Nazo, known in North America as Dragon Power that’s probably best described as Teenage Mutant Ninja Turtles played on a Monopoly board. For all the series successes and failures in gaming, let it never be said that Dragon Ball licenses weren’t willing to experiment with the source material. But while Tenkaichi might have built on Budokai’s success and helped continue to popularize Dragon Ball games in the West, it certainly lacked the focus, refinement, and idiosyncratic flair of the game that immediately preceded it. Re-watch two people playing a match of Budokai 3 and you’ll realize just how well it captured the mood and rhythms of the anime that inspired it. Characters constantly start and stop, trying to get off stiff combos in-between squatting and grunting for seconds at a time. Meanwhile, a generous system of dodges and counters allowed players to hoard ki and occasionally expend it to teleport behind their opponents, sometimes leading to minutes of inter-dimensional bobbing and weaving. Budokai 3 was by no means a world class fighting game (although I certainly wouldn’t mind seeing more fighting games adopt some form of RPG-lite character customization). It was, however, a world class Dragon Ball game. And before anyone tries to tell me that Budokai 1 or 2 were better, let me remind them that neither of those games include Goku’s dad on the roster. Automatic fail. What about you? What Dragon Ball game do you think is the best, or at least is your favorite? Surely we have some Dragon Ball Z For Kinect fans in our midst.